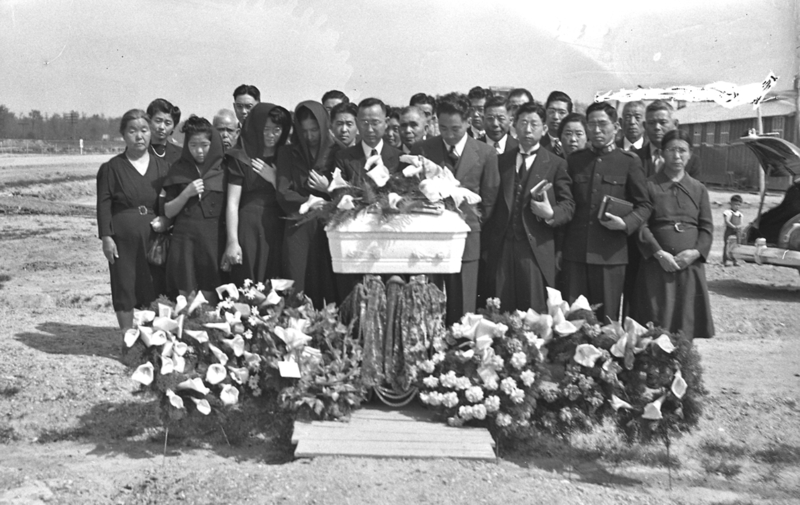 The funeral of Katsumi Yamada, taken in 1943 at the WRA Center near Jerome, Ark. Katsumi’s father, Ted Yamada, is pictured fourth from right in the front row. Grandfather and grandmother Nitta are next to him, along with other incarcerees who were removed from Florin, Calif. Missing from the photo is Katsumi’s mother, who was still recovering from childbirth. Today, Katsumi Yamada and his parents rest together in Lodi, Calf. Feb. 19, 2017, is the 75th anniversary of President Franklin D. Roosevelt’s signing of Executive Order 9066, which authorized the military to evacuate persons of Japanese ancestry from the western states during World War II. Although Feb. 19 is generally referred to as a “Day of Remembrance,” I believe that this year’s anniversary should be broadened by commemorating it as a “Day of Recommitment” for the purpose of motivating a new generation to preserve the legacy created by those who suffered under the prejudice and hysteria sanctioned by E.O. 9066. I suggest three steps for us to follow to recommit toward preserving the legacy left by those whose lives were altered by E.O. 9066. Share the Family’s Story — When discussing how we or our families were affected by E.O. 9066, it is more meaningful if we are able to relate to our family’s story, both the bad and the good. My parents suffered a tragic, personal loss. When my parents arrived at the Jerome War Relocation Authority Center, my mother was pregnant. Shortly after my parents arrived, their first child, Katsumi, was stillborn. We need also to credit good deeds. My maternal grandparents’ farm in Florin, Calif., was one of three farms that was protected by Mr. Bob Fletcher while the three families — Tsukamoto, Okamoto and Nitta — were evacuated and imprisoned in America’s concentration camps. For his act of kindness, Mr. Fletcher incurred the racial resentment of his neighbors and had to give up the security of his state job. When my grandparents returned to Florin, they were able to retake possession of their farm without any problems. To our family, Mr. Fletcher represented the basic decency that should have been shown by Americans who were otherwise so blindly driven by their prejudice, hatred and political ambition. Articulate the Lessons Learned — When discussing E.O. 9066 and its impacts, I have pointed to three lessons that we should always remember. First, E.O. 9066 is an example of racial profiling — a governmental policy based solely on ethnicity to deprive a group of its constitutional rights. E.O. 9066 taught us to guard against such discriminatory governmental policies and actions aimed at denying basic rights and freedoms. The second lesson is that we must remember and honor those who kept their faith in America, even in the most difficult times. E.O. 9066 tried to deny Japanese Americans their rights as citizens by labeling them as “nonaliens,” taking their property without just compensation and imprisoning them in America’s concentration camps without due process. Yet, no person of Japanese ancestry, residing within the U.S., was ever convicted of espionage or sabotage against the U.S. during World War II. Most of those who suffered under E.O. 9066 refused to relinquish their faith in America or their belief that America could offer a better life. They persevered in believing that their rights and freedoms would be restored. Some answered the call to serve while their family and friends were still imprisoned behind barbed wire, guarded by armed U.S. soldiers. The Nisei soldiers served with valor and distinction in defending America. The third lesson is the greatness of America in its willingness to admit its wrongs and make amends for E.O. 9066. E.O. 9066 was a product of failed political leadership. This record was set straight by two governmental actions. E.O. 9066 was revoked by President Gerald Ford on Feb. 19, 1976. Congress passed, then President Ronald Reagan signed into law the Civil Liberties Act of 1988 (aka Redress) that apologized for the unjust imprisonment of persons of Japanese ancestry during World War II and awarded redress payments. Get Involved — The easiest way to get involved is by writing a check. Having held leadership positions in several Japanese American nonprofit organizations, I know that there is one common need: Organizations need money to fund their programs. We can show our support by donating to organizations that are keeping this legacy alive. Another way to get involved is to look for speaking opportunities where we can share our family story and discuss the lessons that we believe must be learned from E.O. 9066 and its application to persons of Japanese ancestry. We can organize a speakers bureau that would be available to schools, civic organizations and social groups. We can get more deeply involved by creating a legacy project for a local community and apply for a grant from the Japanese American Confinement Sites Grant Program, administered by the National Park Service. To ensure continued funding for this program, the NPS needs to receive qualified grant proposals every year. E.O. 9066 is part of our history. If we are not willing to help preserve the legacy of those who suffered under E.O. 9066, their sacrifices will be forgotten, and the injustices imposed by E.O. 9066 may be repeated. Let us use Feb. 19 not only as a time to remember what happened in the past but also as a time to recommit ourselves and the next generation to telling our story.